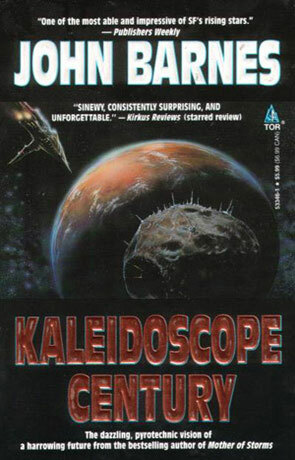 Kaleidoscope Century is the second volume in the Century Next Door series by the author John Barnes. I'm quite sure that I haven't read any John Barnes before and that can only be classified as a big mistake. Barnes is writing like nobody else that I can remember or try to compare him to. It's fast, confusing and very inventive. KC is about, well I'm not even sure what to call the main character as he changes name all the time, but his original name seems to have been Quare, so I'll use that one. It's about Quare and the time between him leaving home as a kid and the first time we meet him when he wakes up in 2109 at the youthful age of 140. Yes, I said youthful age – you see Quare gets kind of sick every fifteen years, goes into a coma and half a year later he wakes up with most of his memories gone and ten years taken of his phyisical age. In other words he only ages five years for every fifteen he lives. All he has for memories is an old (electronic) notebook with a lot of memories he himself has told to the notebook during his past iterations. Barnes paints a picture of a bleak, but eventful century as Quare takes a trip down memory lane with the help of his notebook and even manages to incorporate a concept that I haven't seen used in a SF book before, namely memes* as a weapon. Very interesting. *meme: (pron. "meem") A contagious idea that replicates like a virus, passed on from mind to mind. Memes function the same way genes and viruses do, propagating through communication networks and face-to-face contact between people. The root of the word "memetics," a field of study which postulates that the meme is the basic unit of cultural evolution. Examples of memes include melodies, icons, fashion statements and phrases. Written on 1st June 1999 by TC.